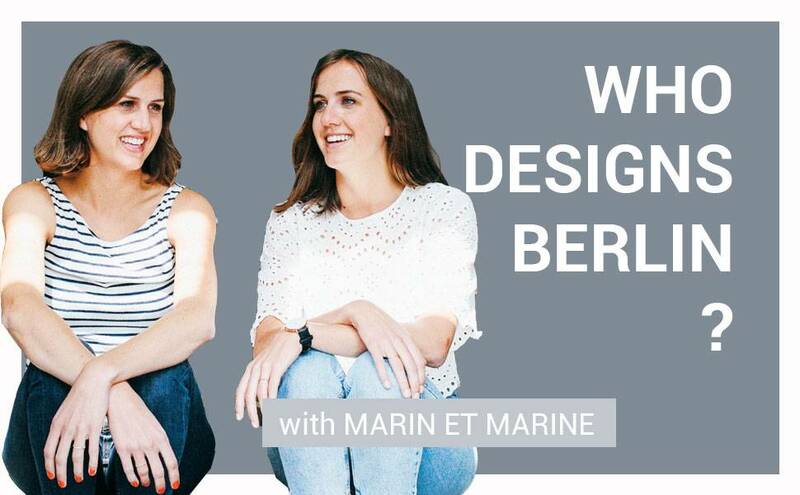 A couple of weeks ago we met with Caroline and Valerie, founders of the colorful bag label “Marin et Marine”, in their new studio on Reichenbergerstrasse. Having desperately been looking for a beautiful yet functional and sustainable bag, they decided to take matters in their own hands and to found their own label in 2013. Back then the twins still had a “real” day job and so they started designing, sewing and even dyeing the fabrics in their small shared flat. Today you will find Marin et Marine’s outstanding bag range in selected shops around Europe. And we’re happy to say that we’re one of them. Together with Tulio of Awesome Berlin, we met with Caro and Valerie and talked to them about their favorite Berlin spots, their inspirations and why they came to Berlin in the first place. Let’s start with some Berlin recommendations. Where will we meet you? What’s your favorite Design/Art Space ? Caro: There are so many, but my favorite ones are the C/O Gallery and the Martin Gropius Bau and of course the Gallery Weekend in spring – it’s amazing! Valerie: DMY (International Design Festival) is very interesting for me, because I’m a product and furniture designer and it’s really interesting to see what’s going on in the Berlin design scene. Valerie: My personal favorite is Nathanja and Heinrich it’s super nice. And for parties I love the Hotel Bar, because of the great funk and soul music. Caro: I agree with Valerie ;) And I love the many outdoor venues you can visit during summer time. A glass of delicious basil smash in the sun and I’m happy. Valerie: And Treptower Park! It’s so beautiful there. 1) Why Berlin? What does the city mean to you? Caro: We came to Berlin because of the city itself. We love this creative vibe and the spirit that makes it so special. And it’s not only the art or design scene. It’s a combination of everything. Especially the different kinds of people who come together and create something that’s just exceptional. I’m free here and I feel like I can do whatever I want. Valerie: Actually Caro was here first and when a cool job opportunity in the furniture design business opened up, I followed her. 2) Does Berlin affect your work? Is it relevant for your work? Valerie: Sure it does, or let’s say the Berlin people do. People are coming here and are not afraid to try something and they’re not afraid of failure. Others won’t judge you for what you do and want. You find so many role models here who inspire us personally and in a professional way. 3) Does your work affect Berlin? How? Valerie: Yes, I think so! Because the Berlin style is usually quite edgy and black and rough, our products are colorful and bright. So we think that we’re bringing a different layer of style to Berlin people. 4) Which place in Berlin inspires you the most? Caro: The water! And as the nearest water is Maybachufer and we spend a lot of time there, this is definitely one of the places that inspires us the most. Valerie: I love the Boule Place by Paul-Lincke-Ufer! It’s super nice and there’s a park where you can just hang around in the sun and relax. And of course the many lakes around Berlin. Last year we even went sailing on Wannsee. That was awesome. 5) Who inspires you the most here in Berlin? Caro: It’s hard to say, if there’s just one person who inspires me. I think it’s rather a couple of people, like my friends who come from different backgrounds and countries and that mix is where I draw my inspiration from. Valerie: My family inspires me – especially my parents. They taught us their entrepreneur spirit and they always inspired us to do our own thing. 6) About you: Would you like to give us a little sneak peak of what to expect from you soon? Valerie: We’ve been working on a new leather backpack – a mixture between the bucket and the sea bag. And we’re thinking about painting fabrics. Very colorful bags – we’re not quite sure how it’s going to look like, but it’ll be really exciting! Caro: And I would like to continue working on paper craft projects. More illustrations, etc. 7) Quick and dirty: Who designs Berlin? Valerie: I think it’s anybody who comes to Berlin and does whatever they want to do. People who just come here, try things and see what’s about to happen.